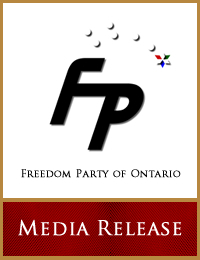 “Freedom Party leader and No Tax for Pan Am Spokesperson Paul McKeever is condemning PC Leader Tim Hudak for his too-little-too-late open letter of September 18, 2011 to Dalton McGuinty concerning cost over-runs in Toronto’s hosting of the 2015 Pan Am Games. Freedom Party formed a No Tax for Pan Am Games committee on August 24, 2009 to oppose taxpayer funding for Toronto’s bid to host the games, and has continued to oppose and document cost over-runs on its notaxforpanam.com web site. Until today, Hudak and the PCs have been utterly silent, and have offered up no defence of the taxpayer with respect to the 2015 Pan Am Games…” Click here to read the full media release.